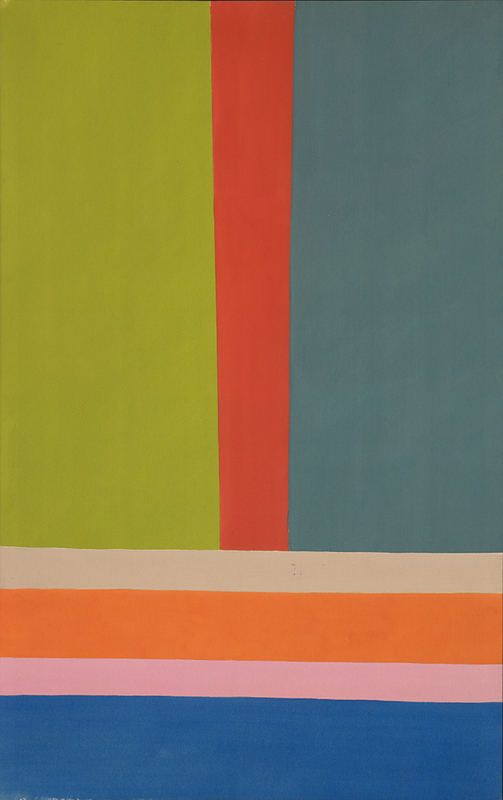 A Celebration of Two Canadian Abstractionists: Jack Bush and Jock Macdonald. “Jack Bush” was at the National Gallery of Canada in Ottawa up to 22nd February 2015, and will be at the Art Gallery of Alberta, Edmonton, 30th May to 23rd August 2015. “Jock Macdonald: Evolving Form” was at the Vancouver Art Gallery, October 2014 to January 2015; is at the Robert McLaughlin Gallery, Oshawa, Ontario, 3rd February until 24th May 2015; and will be at the Art Gallery of Greater Victoria, 12th June to 7th September 2015. Two senior members of Painters Eleven are currently the subject of enormous, traveling retrospective exhibitions in Canada. 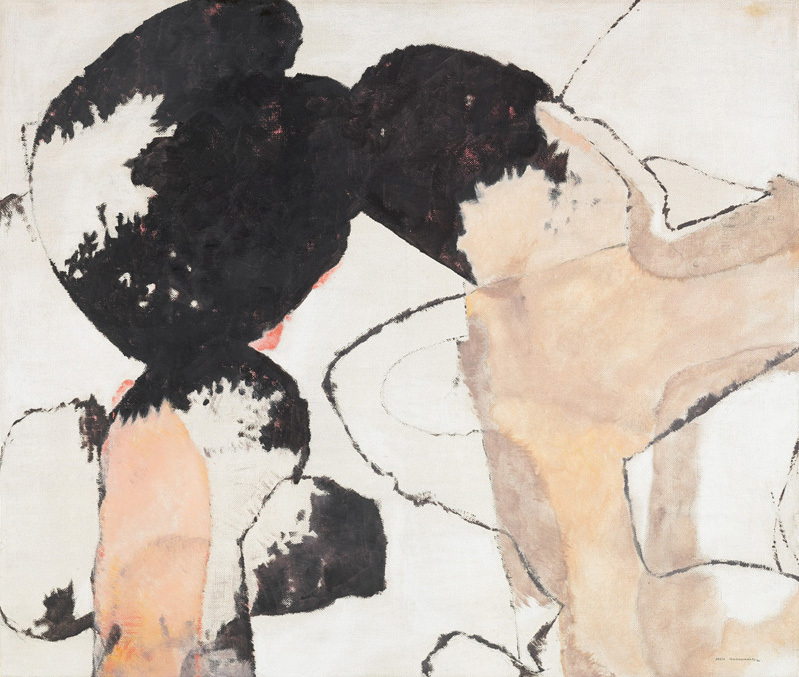 Painters Eleven, who were active as a group from 1953 to 1960, marked a key turning point in the history of art in English-speaking Canada – a pronounced shift away from Europe towards New York and from figuration towards abstraction. Bush is the one most familiar to a British audience. His work is in the Tate Modern and he regularly exhibited with the Waddington Galleries in London. In 1980, three years after his death at the age of 68, the Arts Council of Great Britain circulated an exhibition of 87 works to venues in London, Edinburgh and Birmingham. Macdonald was born in Thurso, Scotland, in 1897 and studied design at the Edinburgh College of Art, but after his emigration to Canada in 1926 to teach design at the Vancouver School of Decorative and Applied Arts, he regrettably had scant presence in the United Kingdom. Both Bush and Macdonald began their careers oriented towards the landscape painting of Canada’s iconic Group of Seven (the subject of an exhibition at the Dulwich Picture Gallery in London from October, 2011 into January, 2012). 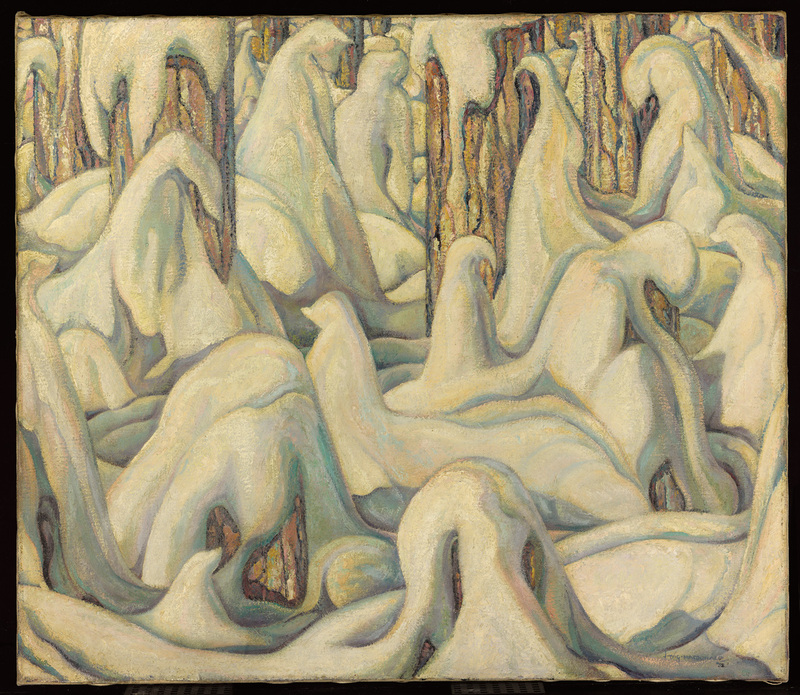 Macdonald’s In the White Forest (1932), with its obvious debt to Lawren Harris, is a case in point. For each of them an important step forward from that rather parochial, highly nationalistic group to an international outlook and the challenges of modernism was involvement with a version of automatism. The two retrospective catalogues bring important new information to bear on that change. Curator Linda Jansma of the Robert McLaughlin Gallery in Oshawa, Ontario, was alerted by the artist’s nephew Alasdair Macdonald to a previously unknown trove of 86 drawings and watercolour automatics plus 38 of Macdonald’s letters in the archives of the Scottish National Gallery of Modern Art in Edinburgh. 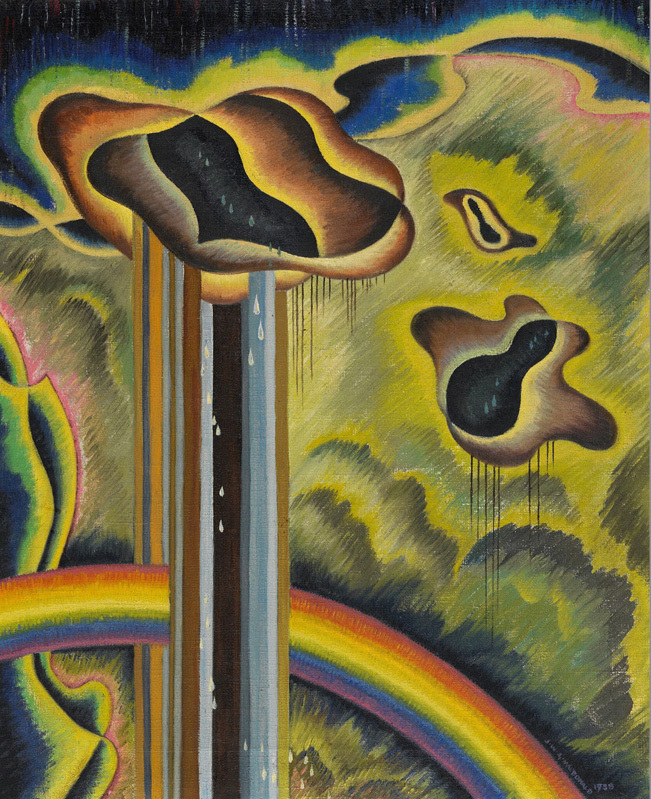 The letters clarify Macdonald’s close relation to Dr. Grace Pailthorpe, a British psycho-analyst and Surrealist painter, and Reuben Mednikoff, another British surrealist painter, both of whom lived, lectured and exhibited their work in Vancouver from 1942-46. Around mid-1945 Macdonald took up automatism in a quest for what Pailthorpe called “the ‘marvelous’ and the beauty of irrational thought and creation.” Yet in comparison with the automatics of Macdonald’s colleague in Painters Eleven, Alexandra Luke, Macdonald’s “automatics” seem over-worked, as if his training in design and his habit of continually referring back to nature, in which he found “a force which is the one order to which the whole universe conforms,” held him back. Like Macdonald’s automatics, Bush’s work was at the time still limited by his preoccupation with what to paint rather than how to paint. The work was more emotionally freighted than before, but he had not yet found his own, mature voice. Dubuffet’s advice only came to full fruition after 1957 when another member of Painters Eleven, Harold Town, introduced Macdonald to Lucite 44, an acrylic resin (n-butyl-methacrylate). Mixed with oil, Lucite 44 allowed the fluidity that Macdonald had long sought and produced the softer, more dilute colours that I take to be typical of his finest work. The force of Greenberg’s advice to Bush can easily be misunderstood, as if Bush were “an aesthetic marionette.” Marc Mayer, Director of the National Gallery of Canada, and curator Adam Welch argue against such an erroneous view in their catalogue essays. 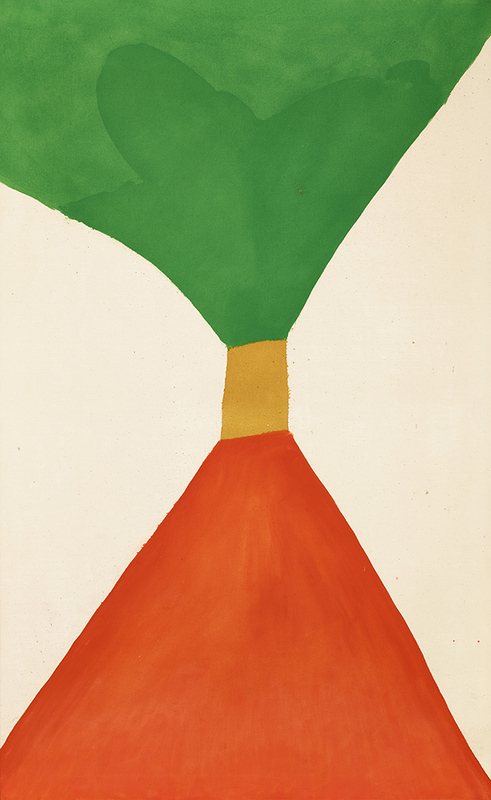 To be sure, Greenberg did suggest that Bush abandon the paint handling the critic referred to as “Tenth-Street Touch,” avoid black so as to bring his strength as a colourist to the fore, and refrain from centering the image too much. But in 1975 I had a conversation with Bush that confirms Mayer’s account of his aesthetic autonomy. Bush described a highly positive studio visit by Greenberg and fellow modernist critic, Kenworth Moffett. They had commented that Bush “was on a roll, and the ‘success ratio’ was very high,” but they had also argued that most of the paintings were upside down from their optimal orientation. Was Bush going to rotate them the suggested 180 degrees? “No.” And why not? “Because they’re wrong.” Clearly Bush was open to workshop criticism, just as T.S. Eliot was to that of Ezra Pound, but he maintained an admirable independence of judgment. Both Macdonald and Bush seemed to have sought extra-aesthetic functions from their art. Macdonald had spiritual ambitions from the beginning. 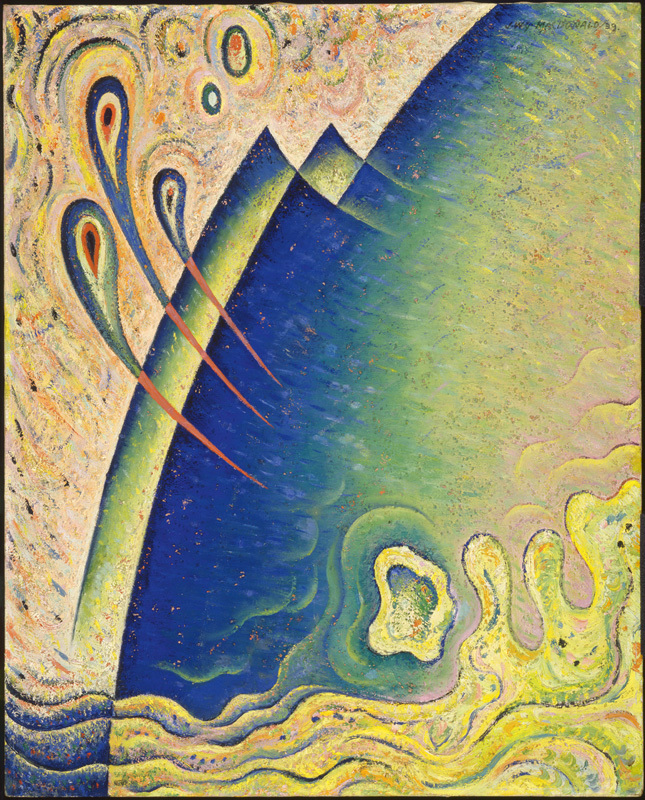 Vancouver had highly knowledgeable men like photographer John Vanderpant and stage designer Harry Täuber who stimulated Macdonald’s extensive spiritual enquiry into the work of Madame Blavatsky, Sir James Jeans, Wassily Kandinsky, Peter Ouspensky, Rudolf Steiner, and others. Anna Hudson argues in her catalogue essay that the De Stijl movement was evidence for Macdonald “of artists’ ability to materialize spiritual and metaphysical truths.” When Macdonald wrote that “the only reality is the spiritual,” he was confessing just how rooted he was in the values of the inter-war period – perhaps not entirely to his advantage. Bush had a habit of not just painting from his feelings, but of painting his feelings out: when he was unhappy with his superiors at his job in commercial art, when a valued colleague and friend like Oscar Cahen died, or when his heart – and then his liver – were troubling him in later years. In the most successful instances, the initial distress the artist felt has been so transformed that only the merest residue of it remains. After Bush’s chest pains were diagnosed as angina he chose a crescent shape to stand for them. In paintings such as Test (1969, not in the exhibition) the repetition of that shape and a schematic of his electrocardiogram are quite painful. Lacking detachment, that painting is unsuccessful. But in Spring Breeze (1971, not in the exhibition) the pink ovoids float rather than bombard and have evolved, now vaguely suggesting flowers – tulips perhaps – and their emotional valence is much more positive. We recognize the artist’s penchant for extracting light and pleasure from even the darkest and most disturbing imagery. This is in keeping with the observation by the great sculptor David Smith that “There is no such thing as truly abstract – all art has to emerge from a life.” Alfred Hitchcock said that to deal with his fears, he had to make films about them. Picasso thought of Les Demoiselles d’Avignon as not just his first cubist painting but also as his first exorcism painting, intended to exorcise his fears of contracting venereal disease in brothels. 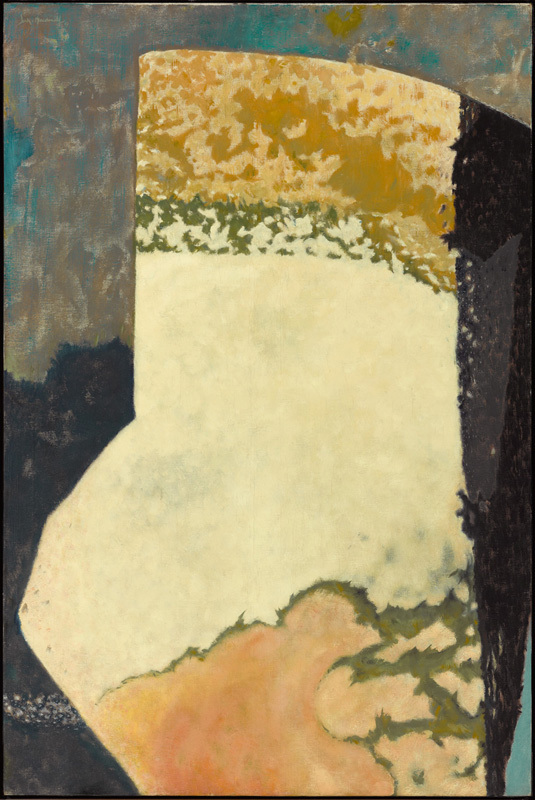 The thin vertical “lifelines” in Clyfford Still’s paintings can be interpreted as the descendants of the “lifeline” that suspended Still when he was lowered as a child into a well. And so on. But where is the highest quality in the work of these two artists? Since both of them re-invented themselves numerous times, there is much room for debate. 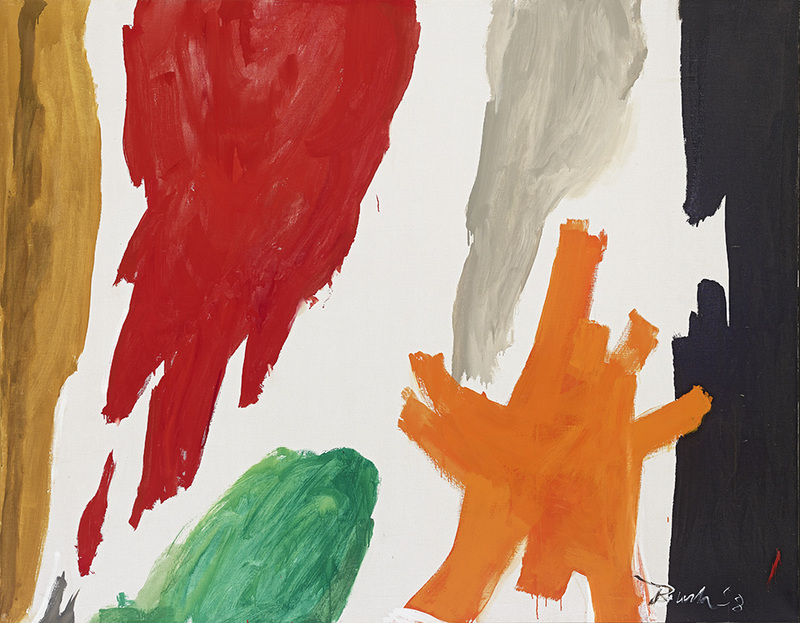 Macdonald’s first abstract work began in 1935 and continued off and on throughout the decade. 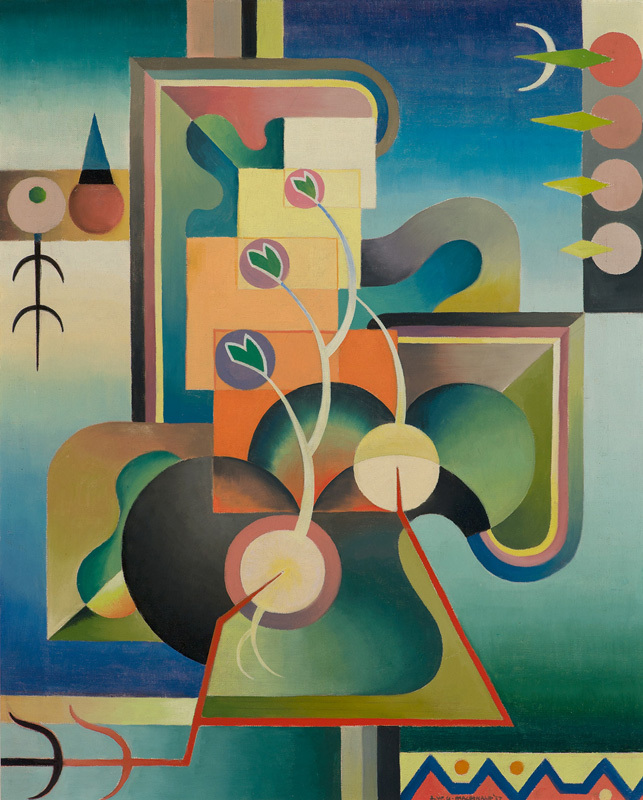 I often find it too suggestive of Kandinsky, although Spring Awakening (1936) is a strong exception to that complaint. At the same time he was doing highly successful, less fully abstract work like Rain (1938) and The Wave (1939). As Ian Thom observes in his catalogue essay, “Macdonald both denies and confirms our sense of space.” In The Wave we clearly look down on the scene from above, but is it the sky or the shore we see on the left? Are those water droplets or amoeba falling from the upper left corner? How much space can be suggested when the surface is pocked with sand? I find that Macdonald’s work of the 1940s and early 1950s is often vitiated by excessive busy-ness: too many colours, too many shapes jostling against one another, too many references to nature that fail to connect with the rest of the picture, too many assertions of forcefulness and control. 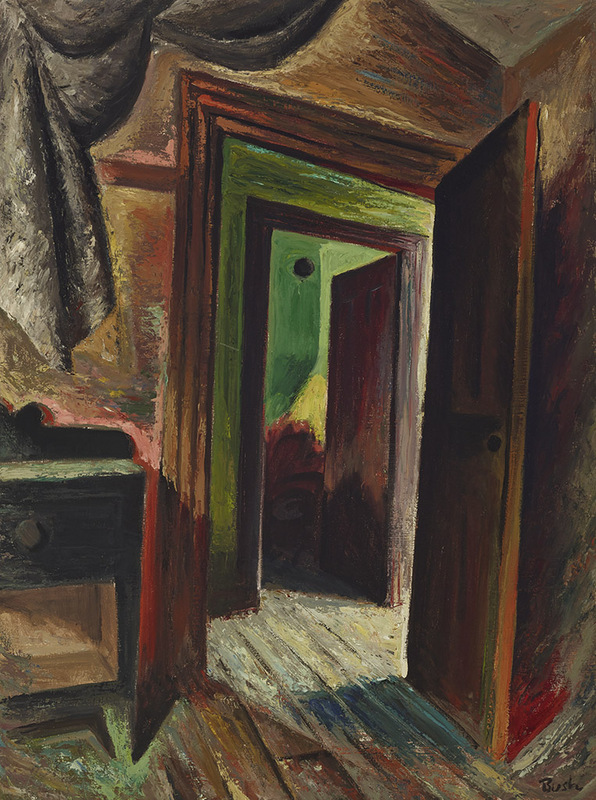 The paintings cannot breathe, and a sense of claustrophobia, of horror vacui even, dominates works like Ritual Dance (1949) and Bearer of Gifts (1952). The occasional exceptions, such as The White Bird (a watercolor of 1952) and Nature’s Pattern (a gouache of 1954), are convincing, but they do not have the strength of his later works painted with Lucite 44, which Macdonald himself said were “far superior” to “anything I have ever done.” In my view, Macdonald was never stronger than he was in the last two years of his life, with works like Fleeting Breath (1959), Heroic Mould (1959) and Far Off Drums (1960.) In the latter painting he allows himself to speak sotto voce. Line just barely retains a sense of continuity. Forms barely grasp the surface and resist our full apprehension. Does this hint at the transitory nature of our pleasures and our tenuous hold on the objects of our affection? Perhaps it does, to the advantage of his art. Unfortunately Macdonald died at the height of his powers in 1960. A mere three or four years at his peak, with something like a signature style, was not enough for him to re-invent himself several times over and convince us of the fertility of his vision as Bush did. Macdonald was one of the greatest teachers of art in the history of Canada, with notable students such as William Ronald and Richard Gorman. Had he not had to teach full time, often with extra teaching during the summer, would he have accomplished more, sooner? Surely he would have. The high points in Bush’s career are much more numerous. I have argued that his maturity dates from his Thrust paintings of 1961. Marc Mayer thinks of their central, recurrent image as priapic, although its source in Gottlieb’s Thrust (1959) is even more apparent. An especially convincing work in this group is Thrust with Blue (1961), where the two main shapes – green and blue – establish a relationship inspired by but quite different from Gottlieb’s dyadic compositions. Karen Wilkin’s catalogue essay makes a persuasive argument that Bush’s vocabulary of both colour and forms is “rooted in observed actuality.” Bush could be classified as what I call an “image-bank” painter, with his creativity fueled by various objects he had seen. His work stands in striking contrast to the resolutely non-referential and seemingly more precise and refined art of his American counterparts. In 1977, the last year of his life, he said, “I don’t look for anything. It comes to me. I may be walking along a road and I see a mark on the road; it looks interesting, so I try it out as a painting. 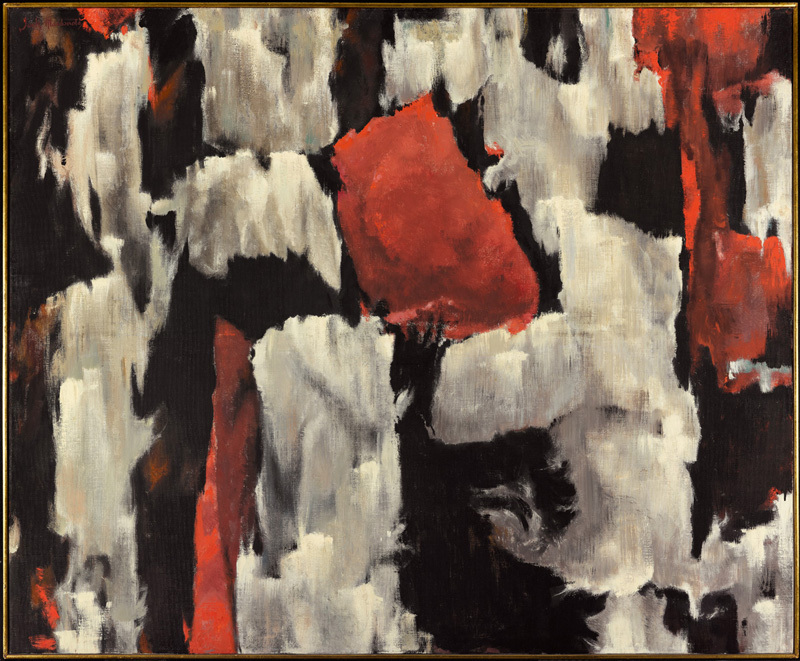 Or looking at some flowers in the garden – how can I get the feel of those colours…?” An outstanding example is Ascension #1 (1962) in which St. Mark’s Cathedral in Venice and the Italian flag have been subsumed into a convincing abstract painting of great power. His Sash paintings, which I take to be another high point in his art, had numerous sources: a colourful dress on a manikin, the view out of Bush’s tent, and a martini glass. Tight Sash (1963) and Pinched Orange (1964) are strong examples. Their colour areas have a motility that is distinctive to Bush. They are by no means Noland’s neutral containers for colour but instead function as dynamic shapes that can press, warp, or tighten and so vitalize these fine works. Paintings like English Visit and Grey V (both 1967) were excoriated in Artnews by Al Brunelle as like “herding sheep,” but the best of them have a counterpoise of numerous different directional forces that Brunelle seems not to have noticed. In Grey V the dynamically slanted central bank of colour bands is anchored at the top right corner and at the centre-bottom, and the other two banks of colour bands are aligned with the perimeter, so that a sense of repose is no less than that of motility. The paintings with mottled, rollered grounds were in part a response to the work of Lawrence Poons, who showed with Bush’s Toronto dealer, David Mirvish. Bush was stimulated by the interpenetrating colours that Poons achieved by throwing buckets of paint at the canvas. Bush created his own distinctly personal version by dropping a few dollops of one colour into a pan of another colour that had been chosen for the ground, and dipping his roller into that unmixed paint. There are many masterpieces, including Rising (19970) and January No. 6 (1972, not in the exhibition). Technically, these may be figure-ground paintings, but Bush had learned from Hans Hofmann, one of whose works on paper he owned, that the figure-ground relation can be subverted if some raw canvas is left at the perimeter. As Walter Darby Bannard has explained, the “ground” will then float, just as the various figures do. The “ground” becomes a field, and the picture gains a spatial richness that it might otherwise not have. The so-called musical pictures, with background colour applied by sponges and rags, might also be loosely called figure-ground paintings. Again, there are many great ones. Chopsticks (1977) is an ebullient work that reminds of Bush’s interest in jazz. 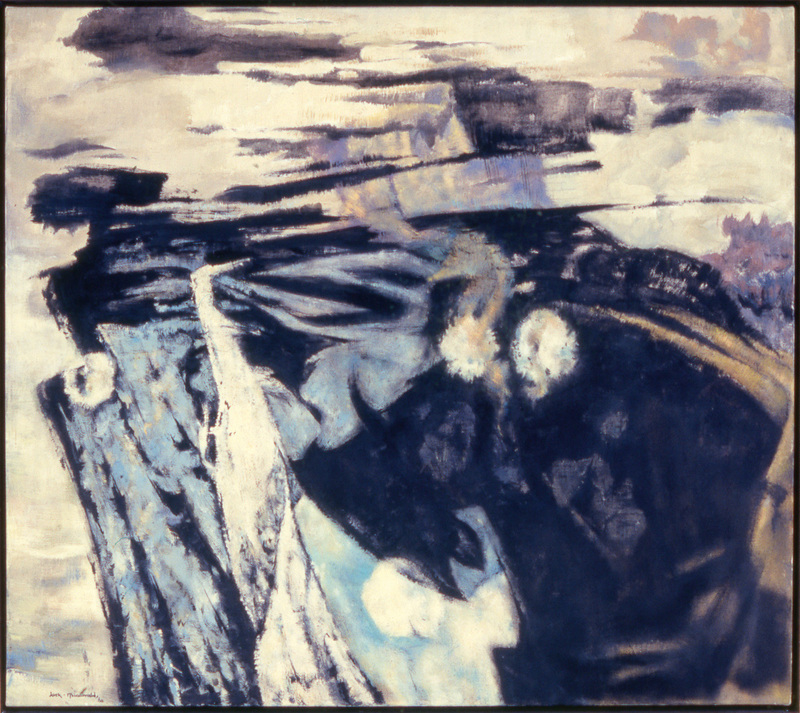 But Basie Blues (1975), with its colour “notes” coming to rest at the bottom of the painting, reminds me of the last works by Titian or Van Gogh, with a suggestion that the artist is subliminally aware of his impending mortality. Perhaps the greatest accomplishment of Bush is that his work is grounded in human struggle and a depth of human feeling. So why has Macdonald, even within the brief period of his highest accomplishment, been so much less exportable than Bush, never successful in getting a dealer outside of Canada? And if Bush has powers the equal of Kelly, Noland or Louis, which I believe he has, why has he not had his due? To be sure, Bush was in Greenberg’s Post Painterly Abstraction exhibition of 1964; the Boston Museum of Fine Arts opened its new contemporary wing in 1972 with a one-man show of Bush, and the Tate issued a set of playing cards depicting their Sash painting, but he is not in the Museum of Modern Art nor the Centre Pompidou, as I believe he should be. Perhaps a major part of the explanation is the predilection for stylistic compromises that characterizes much of their work. Those compromises are particularly striking in Macdonald. Even at the height of his career his work could have a high dosage of what Greenberg called “homeless representation,” i.e., a suggestion of landscape space without the landscape. A prime example is Elemental Fury (1960). As good as it is, it does not strike out into new territory the way Bush so often did. 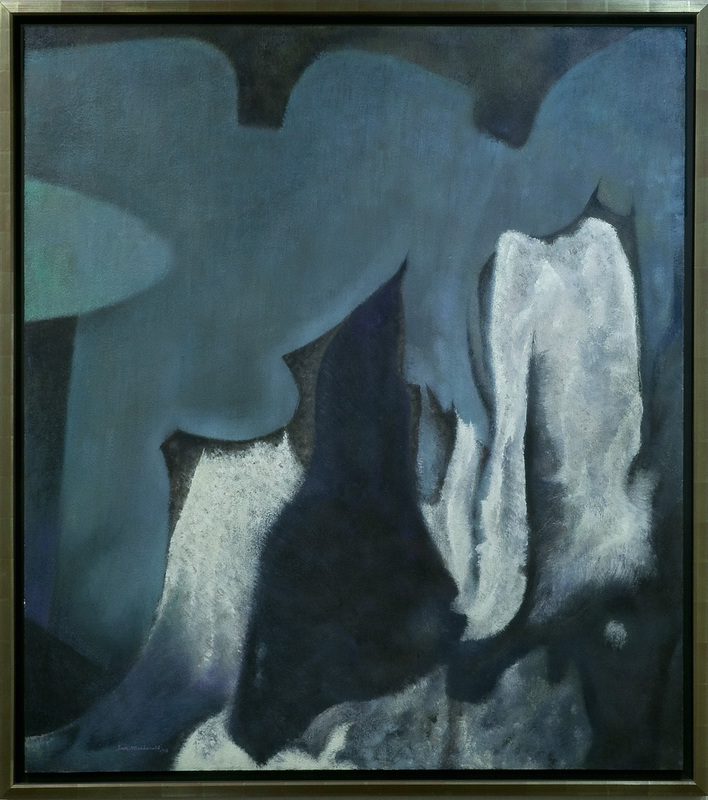 Nor does the striking Lament (1958) with its gelid palette giving a hint of Lawren Harris’ icy mountain peaks. Bush’s seeming compromises are a different matter. Bush was fully immersed in up-to-the-minute high modernism, being good friends with Noland, Olitski, Caro, etc. Nonetheless, he retained an interest in figure-ground painting when most advanced artists had long abandoned it, and his space is seldom so resolutely indeterminate as it is in Olitski, or so radically reduced as it is in Noland. Even more, his hand is readily apparent, as it seldom is in such post-Pollock abstractionists as Kelly, Louis and Noland. Noland’s demand that his studio assistants take a floor polisher to some of his paintings so that any suggestion of activity by the hand would be obliterated is inconceivable in Bush. 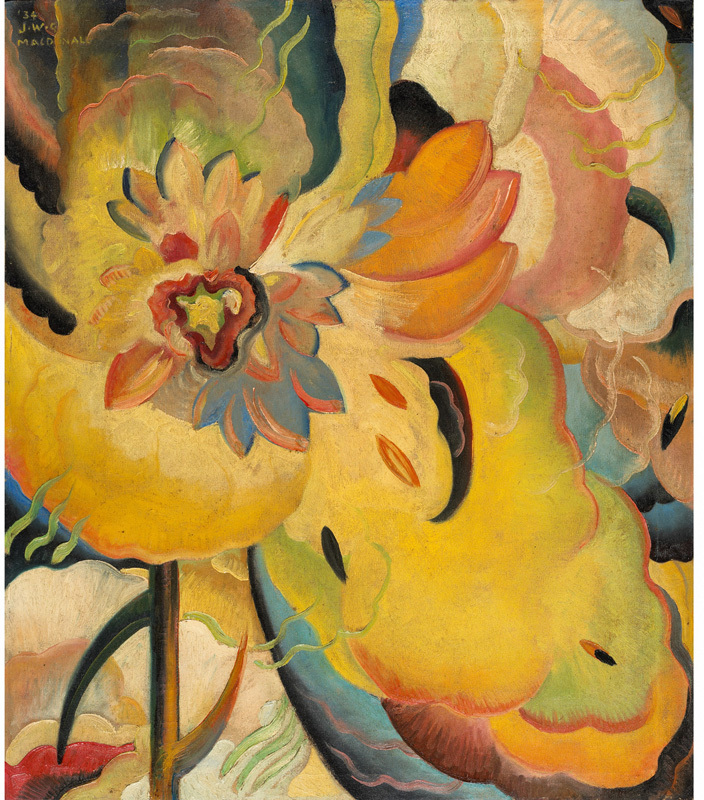 And, as Karen Wilkin observes in her catalogue essay, even Bush’s mature works are often imagist, sometimes with a suggestion of flowers more apparent than in any of Louis’s Florals. Perhaps this urge to be both advanced and yet also conserve the values of the past stamp Bush and Macdonald as distinctly Canadian, raised in a country in which tensions between Anglophone, francophone and native communities have produced a nation expert at tolerance and compromise. Moreover, as Gad Horowitz has demonstrated, Canada had enough of “Toryism” with its Family Compact oligarchy that a reaction emerged on the left, so that Canada is more ideologically diverse than the United States, and tolerance for differences in belief is greater. In Bush’s case, these apparent “compromises” could be best understood as what Michael Fried called “all-together painting,” i.e., a comprehensive absorption of the best art of the previous several generations into a grand synthesis of art history such as he found in Manet and as William Rubin unearthed in Jackson Pollock. 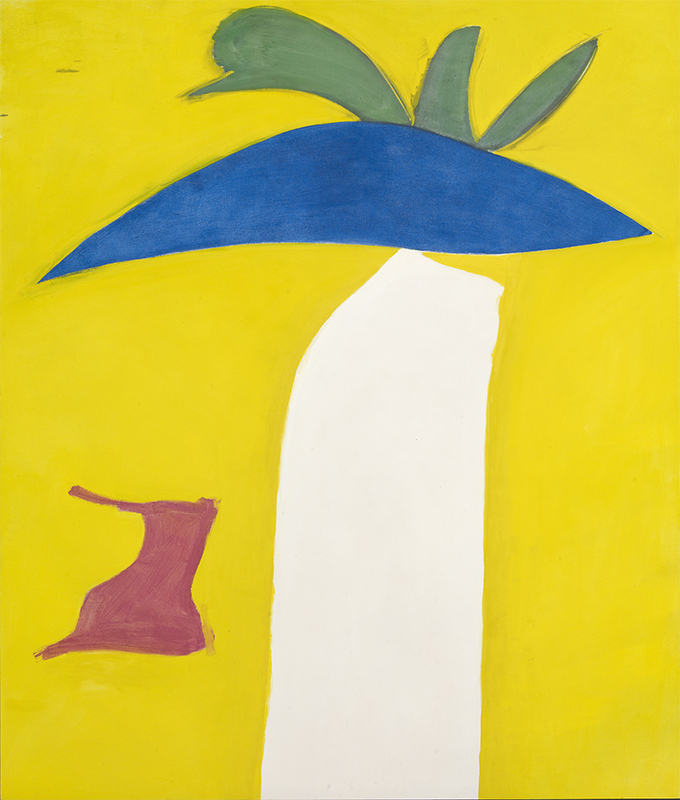 Bush assimilated Matisse and Miro, Hofmann and Gottlieb, and even artists of the next, younger generation like Poons. Given the rich diversity of his sources, his “compromises” seem to me more like an inventive set of resolved tensions and a creative fusion of much that was best in modern art. Johann Sebastian Bach was viewed in his time as “old-fashioned” and out of step with modern practice, and yet is unquestionably acknowledged today as one of the very greatest of all composers. For a while, later Monet could seem like an obsolete cul-de-sac in art history rather than a prime source for Pollock such as as we now believe he was. Bonnard has at times been seen as somewhat behind the times, but we can now see that he managed to create something new out of Impressionism. Advancedness in and of itself is no litmus test for great art. Perhaps Bush and Macdonald were not always advanced to the utmost degree, but their very substantial accomplishments are not at all diminished by that. In my view, Macdonald deserves a much wider audience abroad, and Bush stands as one of the supreme painters of his time. ← #6. Robin Greenwood writes on Richard Diebenkorn and the Hollowing-out of Painting. I was particularly pleased to read this article. I enjoyed learning more about MacDonald (Far Off Drums looked especially intriguing) and Jack Bush is such a wonderful painter with a surety of colour and a significant use of touch that sets his work so far ahead of so much other abstract painting. I have seen a few late “Sash” (I used to term them “arabesques”) ones which possess an almost tragic beauty, like a late Manet flower painting perhaps? His touch makes a lot of painters working with very conservative easel painting techniques look pedestrian by comparison. There is a pace and crispness about the brush stroke; his colour is so far reaching and aerial also – more rewarding for me, than Hofmann’s “Teutonic” palette. Bush’s paintings are fresh and uplifting to see. They have the trappings of a reductive approach but they are far from it. The sometimes – deliberately – ungainly drawing frees the colour. I first encountered his work as a student, absorbed it and learnt from it. Figure/ground painting was something that I was, and still am, a little uncertain about, but the way he went about it was terrific. The paintings are often very large – again so good to see big uncompromising colour based abstract paintings. It was also intriguing to read the political slant, in comparison to the States. I said in the Diebenkorn thread, I am not convinced we really do abstract painting in this country, though I had never thought about it in those terms. I would be hugely surprised yet delighted to see a major Jack Bush show over here. Thank you Mr Carpenter for drawing attention to him! ……“homeless representation” – what a lovely turn of phrase. That pink in “Big A” also – look at that! I share Emyr’s enthusiasm here – but especially for the early Macdonalds, which look an unassuming delight. They remind me a little of the pre-1910 Malevich works in the first room of the recent Tate show, which had such an inventive decorative charm and an intense facility for colour modulation, the resourcefulness of which never allowed the ornamentation to slip into banality. In Malevich’s case, the heavy-duty conceptualisation took over soon after and closed everything down. Something similar, though not as detrimental, perhaps knocked a little of the life out of Macdonald in the fifties – probably too much American influence? I do think the late fifties/early sixties, whilst giving rise to lots of new ideas in art, sometimes fucked up interesting artists who might have done better had they been left alone. 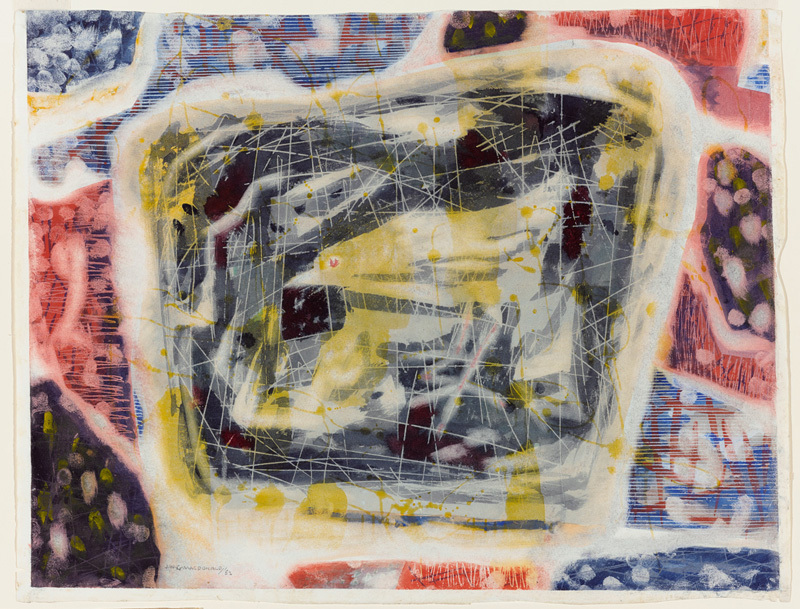 Bush is lively and energetic, especially when compared to the bloodlessness of Diebenkorn, and he was incredibly influential amongst some of the best British abstract painters of the seventies and eighties – notably John McLean and Fred Pollock – perhaps more so than Frankenthaler and Noland. Personally, I am a bit bored with the flat formats, and the good colour is not enough of a compensation. But the Macdonalds I would love to see, and more. “Formative Colour Activity” looks great. I’m smitten, and I want to see the real thing. I believe Jack Bush’s peculiarities will eventually been seen as strengths. His show at the Serpentine in the early 80’s was a revelation to me. When I think that Louis and Bush were working away with such extraordinary pictorial ambition of scale and colour, it is clear we have no such situation today. They did, of course, have access to very good and supportive galleries to show these works in, and financial feedback. Walter Darby Bannard has mentioned the growth today of super-galleries, where commercial interests dominate the international field. Art’s international face is no longer artist-led. Making good painting now is even harder, as there is no climate, no scene. Bush is so good, so particular, that I found him difficult to take from as a painter. Even Pollock was easier to absorb through Automatism. I’m fascinated about the bare canvas strips at the edge and what that does to the floating image. To me these pictorial solutions/choices are still pertinent and very much alive. Thank you Ken. Diebenkorn is not bloodless. Just full of that bright and wonderful southern California sunshine. Environment! Readers of this article by Ken Carpenter would be well advised to publish the article URL link on their social media platforms to encourage wider audience viewing. Being an abstract artist, and collector of Painters Eleven, my view is that the more people that are introduced and further informed about the members of P11, all the better. Painters Eleven kicked open the doors to increasing awareness and acceptance of abstraction in Ontario. Ken Carpenters article maintains this goal in its own way. Ken Carpenter’s piece is, as usual, clear, informative, and full of insights. I didn’t know much about Macdonald, so I learned more about him. I do know Bush’s work well, but even here I learned from the article. I will add that Jack’s claim that Clem Greenberg and I once told him that all of his paintings which we were seeing were upside down is pure fiction. Reblogged this on Darren Edwards. them and interesting comments about their successes and limitations. analysis of paintings; it is as if no-one is looking. This is inspiring and gives me several things to think about.